Naive Bayes is a simple and powerful technique that you should be testing and using on your classification problems. It is simple to understand, gives good results and is fast to build a model and make predictions. For these reasons alone you should take a closer look at the algorithm. In a recent blog post, you learned how to implement the Naive Bayes algorithm from scratch in python. In this post you will learn tips and tricks to get the most from the Naive Bayes algorithm. Naive Bayes can handle missing data. Attributes are handled separately by the algorithm at both model construction time and prediction time. As such, if a data instance has a missing value for an attribute, it can be ignored while preparing the model, and ignored when a probability is calculated for a class value. Probabilities are often small numbers. To calculate joint probabilities, you need to multiply probabilities together. When you multiply one small number by another small number, you get a very small number. It is possible to get into difficulty with the precision of your floating point values, such as under-runs. To avoid this problem, work in the log probability space (take the logarithm of your probabilities). This works because to make a prediction in Naive Bayes we need to know which class has the larger probability (rank) rather than what the specific probability was. To use Naive Bayes with categorical attributes, you calculate a frequency for each observation. To use Naive Bayes with real-valued attributes, you can summarize the density of the attribute using a Gaussian distribution. Alternatively you can use another functional form that better describes the distribution of the data, such as an exponential. Don’t constrain yourself to the distributions used in examples of the Naive Bayes algorithm. Choose distributions that best characterize your data and prediction problem. Feature selection is the selection of those data attributes that best characterize a predicted variable. In Naive Bayes, the probabilities for each attribute are calculated independently from the training dataset. You can use a search algorithm to explore the combination of the probabilities of different attributes together and evaluate their performance at predicting the output variable. Is their a well-defined subset of your data that responds well to the the Naive Bayes probabilistic approach? Identifying and separating out segments that are easily handled by a simple probabilistic approach like Naive Bayes can give you increase performance and focus on the elements of the problem that are more difficult to model. Explore different subsets, such as as the average or popular cases that are very likely handled well by Naive Bayes. Calculate the probabilities for each attribute is very fast. This benefit of Naive Bayes means that you can re-calculate the probabilities as the data changes. This may be monthly, daily, even hourly. This is something that may be unthinkable for other algorithms, but should be tested when using Naive Bayes if there is some temporal drift in the problem being modeled. The Naive Bayes method characterizes the problem, which in turn can be used for making predictions about unseen data. This probabilistic characterization can also be used to generate instances of the problem. In the case of a numeric vector, the probability distributions can be sampled to create new fictitious vectors. In the case of text (a very popular application of Naive Bayes), the model can be used to create fictitious input documents. How might this be useful in your problem? At the very least you can use the generative approach to help provide context for what the model has characterized. The performance of Naive Bayes can degrade if the data contains highly correlated features. This is because the highly correlated features are voted for twice in the model, over inflating their importance. Evaluate the correlation of attributes pairwise with each other using a correlation matrix and remove those features that are the most highly correlated. Nevertheless, always test your problem before and after such a change and stick with the form of the problem that leads to the better results. The probabilities for each attribute are calculated independently. This is the independence assumption in the approach and the reason why it has it’s name “naive”. You can exploit this assumption to further speed up the execution of the algorithm by calculating attribute probabilities in parallel. Depending on the size of the dataset and your resources, you could do this using different CPUs, different machines or different clusters. Naive Bayes does not need a lot of data to perform well. It needs enough data to understand the probabilistic relationship of each attribute in isolation with the output variable. Given that interactions between attributes are ignored in the model, we do not need examples of these interactions and therefore generally less data than other algorithms, such as logistic regression. Further, it is less likely to overfit the training data with a smaller sample size. Try Naive Bayes if you do not have much training data. Naive Bayes will not be reliable if there are significant differences in the attribute distributions compared to the training dataset. An important example of this is the case where a categorical attribute has a value that was not observed in training. In this case, the model will assign a 0 probability and be unable to make a prediction. These cases should be checked for and handled differently. After such cases have been resolved (an answer is known), the probabilities should be recalculated and the model updated. An interesting point about Naive Bayes is that even when the independence assumption is violated and there are clear known relationships between attributes, it works anyway. Importantly, this is one of the reasons why you need to spot check a variety of algorithms on a given problem, because the results can very likely surprise you. In this post you learned a lot about how to use and get more out of the Naive Bayes algorithm. Do you have some tricks and tips for using Naive Bayes not covered in this post Leave a comment. Small thing. I think you meant “join[t]” probabilities in section 2. I’m following your information every day. I have one unclear idea concerning naive Bayes, I used to train and test the algorithm with the same data-set but the accuracy is not 100%. why it doesn’t so? The algorithm is implemented with python with help of your posts, and I used to train the algorithm with SEER cancer data after careful preparation; again I used for the testing the same file with the separate calling, the accuracy yet not 100%. I’m glad ou found the post useful Matthew. Thanks for the explanation on how to improve on Naive Bayes Jason. I read through your posts on Naive Bayes, but I’m not entirely sure on the disadvantages of using the algorithm. 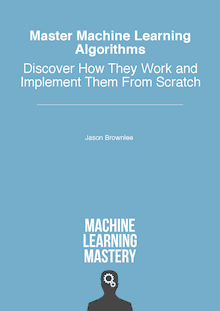 I searched around on possible disadvantages, such as poor estimator, works poorly with highly correlated features, etc., but is it possible that features with similar means and standard deviations could cause the algorithm to perform poorly? The main limitation is that the algorithm does not capture the joint distributions of input variables. That is, any interesting and useful interactions between input features and their contribution to the output variable. The so-called independence assumption of naive bayes. You could contrive a dataset where the joint distribution of two contrived variables is needed to make accurate predictions and show when naive bayes falls down. I apologize for the late reply. Thank you for the explanation. That did help. There are more than 3000 samples in trainset and more than 750 samples in testset. And the samples should be classified into 95 categories. And i got 39% accuracy finally. How can i improve the accuracy. Increase trainning samples? or decrease categories? With so many categories, I expect accuracy does not mean anything any more johnson. Consider log loss or AUC instead? I searched google, someone suggests that use so called “one-against-many” scheme. I tried, but when categories grows, the accurary declines very quickly. Can you give an example of log loss or AUC? one-against-many: you begin with a two-class classifier (Class A and ‘all else’) then the results in the ‘all else’ class are returned to the algorithm for classification into Class B and ‘all else’, etc. A one-vs-all or similar is the structure of the model, not the performance measure. why my comment always gets lost? use log loss or AUC in native bayes? Could you give me an example for it? I moderate comments, I do it every 24 hours. Awesome, to make the result more accurate. Thanks for putting all the loophole of Naive Bayes at a single place. It was tough initially. Now I got a clear pic of Navie Bayes . Can you give some practical example of Remove redundant feature. If I remove one feature that has the same value of another feature should I retrain the model ? Great , It helped a lot. what could be the alpha value range in Naive Bayes algorithm for smoothing? Why can’t we apply Naive Bayes on negative values? Can I apply log-loss metric on naive bayes model performance while using log-probabilities because if we use log-probabilities then it gives real values but log-loss expects values from [0,1]. I don’t follow, what is the problem you are having exactly? The model has feature vectors with both label 0 and 1. I want to use Naive Bayes to predict a feature given positive labels, say 0. How to do that?